Fantasy Football Wide Receiver Rankings (Draft Edition) - Fantasy Football, Fantasy Football Rankings | Mac Bros.
Randy Moss, Terrell Owens, and Reggie Wayne top the Mac Bros. list of Fantasy Football Wide Receiver Rankings. For a complete rundown and rankings on all positions, with detailed comments, and Top 250 drafting guide, make sure to sign up to receive our free draft kit. It makes a great cheat sheet come draft day. Here now, is a sneak preview at the Mac Bros. Fantasy Football Wide Receiver Rankings (Draft Edition). 1. 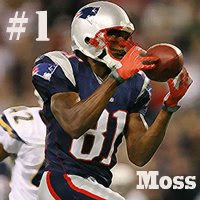 Randy Moss (NE) Bye Week 4 After a monster ’07 season, Moss returns as this year’s pick as “the fantasy WR”. While he will be hard pressed to repeat his lofty numbers of a season ago, Moss should remain head and shoulders above the rest. 2. Terrell Owens (DAL) Bye Week 10 Expect another huge fantasy campaign for this top flight wide out. T.O. will remain the top target in a high-powered Dallas attack that enabled him to accumulate over 1,300 yards and 15 TD’s last season. 3. Reggie Wayne (IND) Bye Week 4 Despite the return of Marvin Harrison, Wayne should remain Peyton Manning’s go to guy in ’08. This deep threat is as consistent as they come, and a top flight fantasy WR. 4. Braylon Edwards (CLE) Bye Week 5 He is coming off of a breakout season in which he totaled 1,106 receiving yards. His 16 receiving TD’s ranked him second in the NFL behind only Randy Moss in ’07. Edwards has great chemistry with signal caller Derek Anderson, and he is expected to be among the best fantasy WR’s in ’08. 5. Andre Johnson (HOU) Bye Week 8 In spite of missing 7 games last season, this stud wide out still managed to accumulate an impressive 60 receptions for 851 yards and 8 TD’s. If Johnson can stay off of the sidelines for the entire 2008 season, he could easily become the most productive WR in all of fantasy football. Click here to see the entire Top 80 Fantasy Football Wide Receivers.